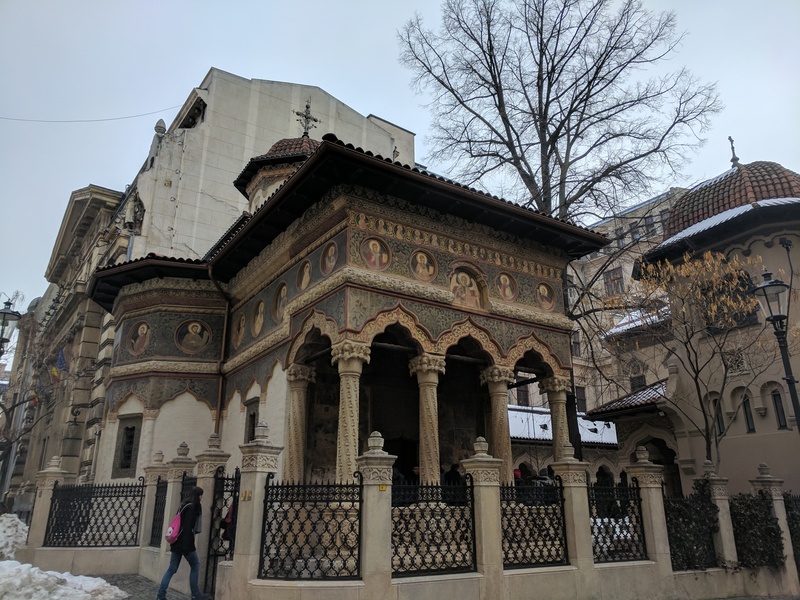 On the weekend of Feb. 17-19, I took a trip to Bucharest, Romania. 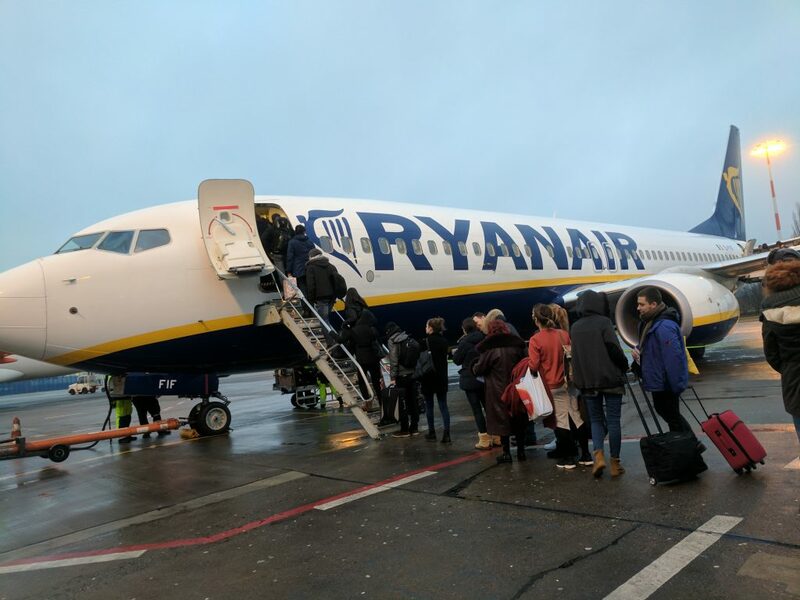 I found a great Ryanair deal for 20€ return, so I went for it and planned a weekend trip. I arrived at the airport on Friday around 21:00 (9 PM) and went through immigration (Romania is in the EU, but not the Schengen Area. Therefore, one must pass immigration for an intra-EU flight). The line situation was a bit chaotic, but I managed to get through without too much of a wait. Customs was a breeze as it always is in Europe, and soon I made it to the arrivals hall. I went downstairs, where there is a supermarket. 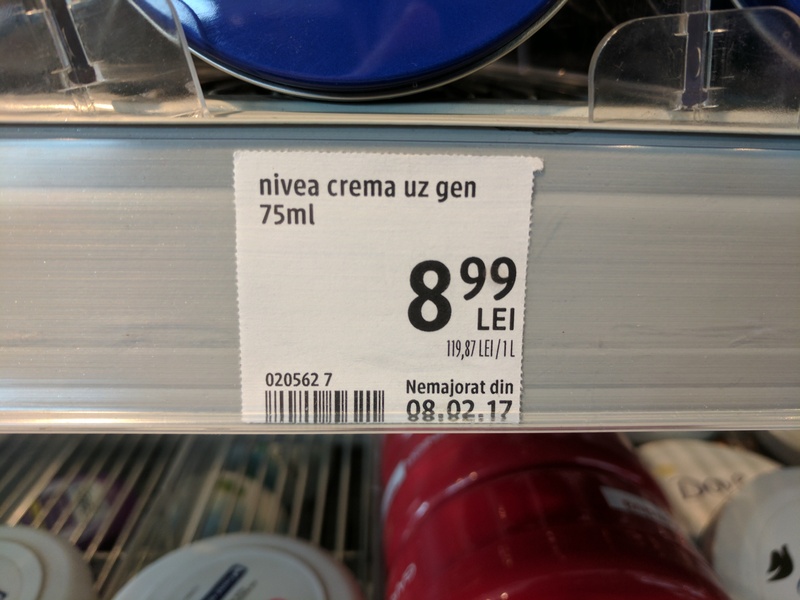 This supermarket, as I learned from Wikitravel, is the only reasonably priced/normally priced store at the airport. I walked around and bought some things, before heading out to the bus stop. 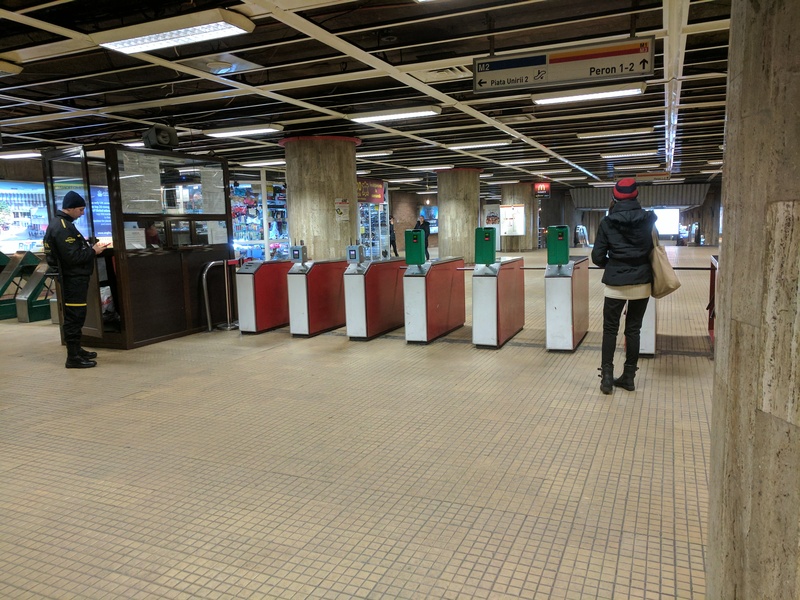 The way that ratb‘s stored value travel card system works is like any other. You buy a card (for 3.70 Lei, about USD 0.87), called an Activ card, load money into it, and then tap it when you board the bus or tram. 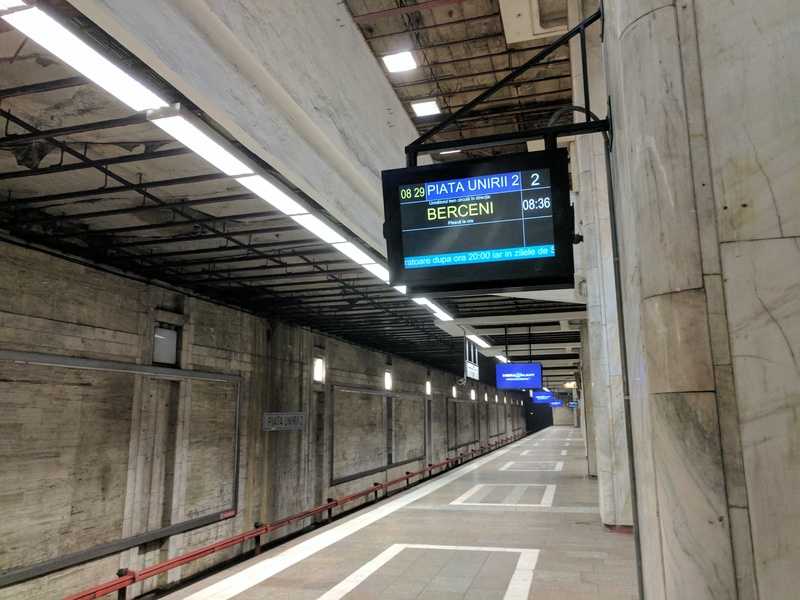 If you’re caught without a valid travel card or ticket, you’re fined 50 Lei, or about USD 11.75. As of today, one ride on the bus or tram costs 1.3 Lei, which is about USD 0.30. You can also buy a cheaper Multiplu card, which costs 1.60 Lei, or about USD 0.37. The Multiplu card holds a specific number of journeys or day/week pass and cannot be reloaded. I opted for the reloadable Activ card. 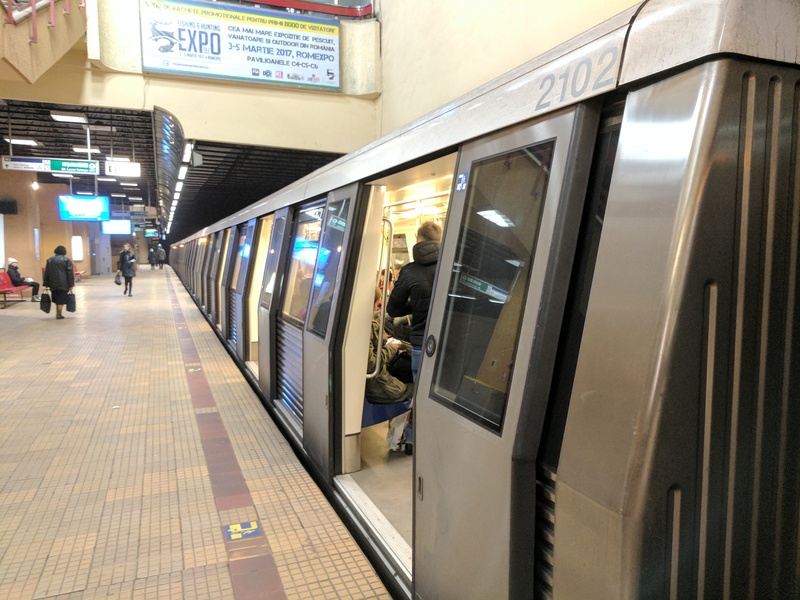 For the metro, I bought a day pass for 8 Lei (about USD 1.87) and used the metro for most of my transportation. I did take a joy ride on a tram, though. Quite a bumpy ride. 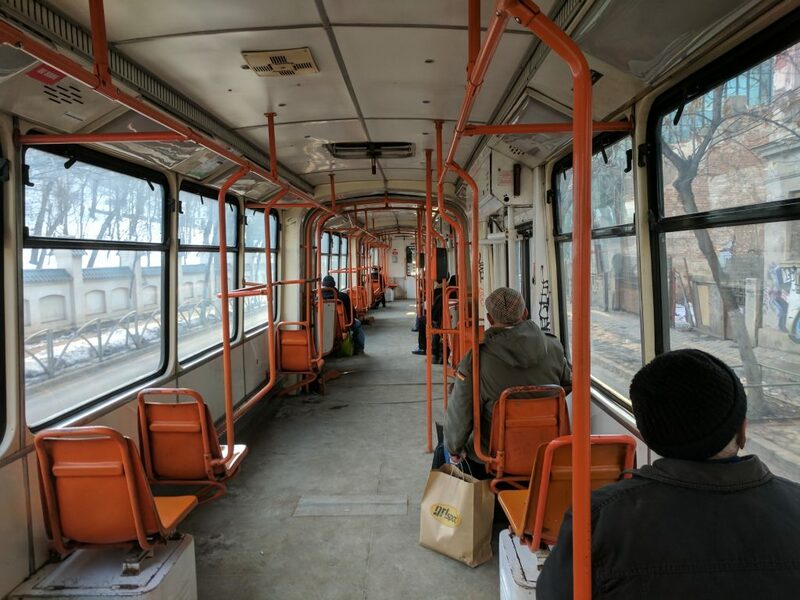 The interior of a Bucharest tram. I bought my Activ card and got on the bus. I had to wait 20 minutes since I had just missed the previous bus. 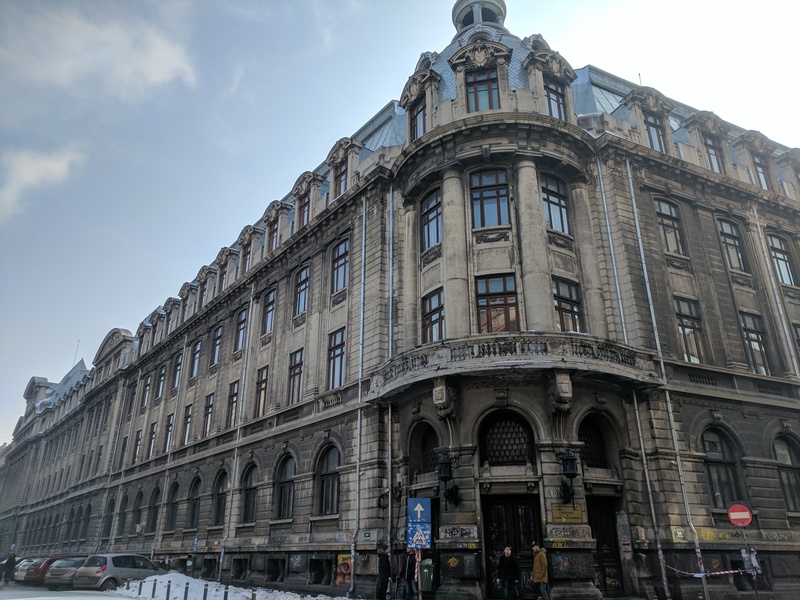 Once I reached the Piața Unirii (Central square), I walked about 7 minutes to my hostel. Very nice. Entrance to the Piata Unirii Metro Station, with the Square in the background. I stayed in the Antique Hostel, which cost about USD 10 per night. 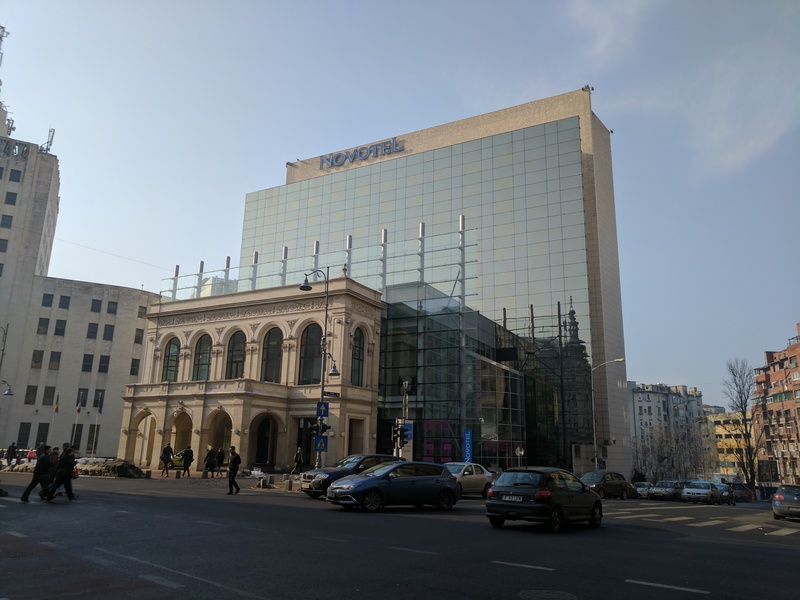 This was a few dollars/euros more than the other hostels, but the very convenient location of this hostel to the city center made it worth it. The hostel itself was an old, beautiful building. It was also very clean and comfortable. I made friends with the night receptionist, which was cool. I always meet great people when I travel. 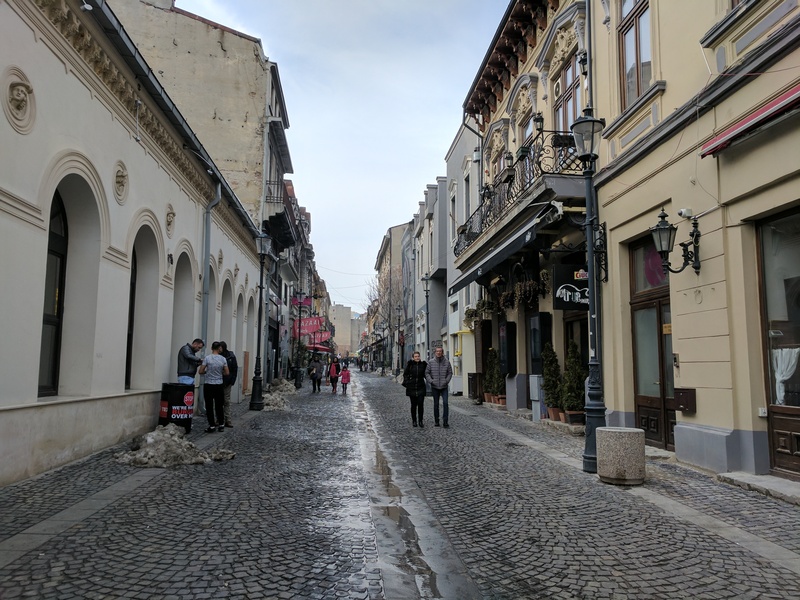 Saturday was my only full day in Bucharest. I woke up around 7:30 and was out of the hostel by 8. 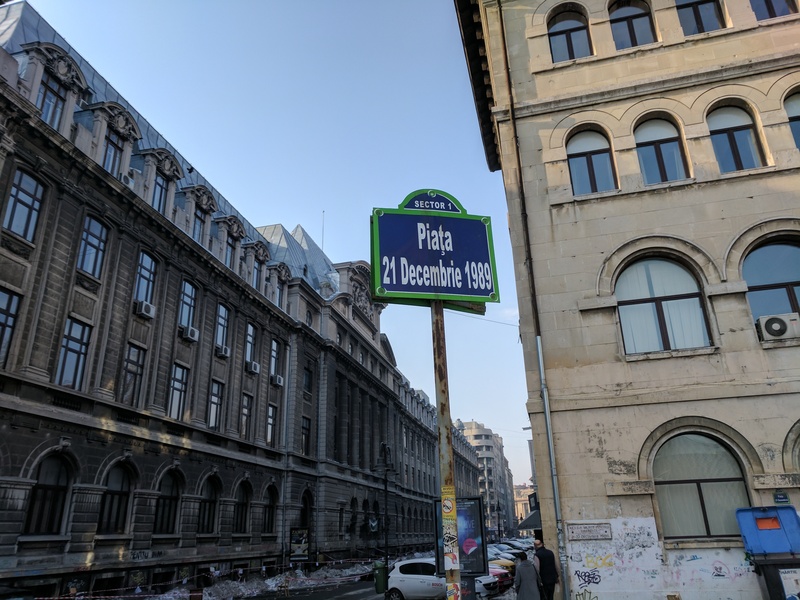 I started by walking over to the Piața Unirii and taking the metro to the Piața Romană, one of the other major squares connected by boulevards. 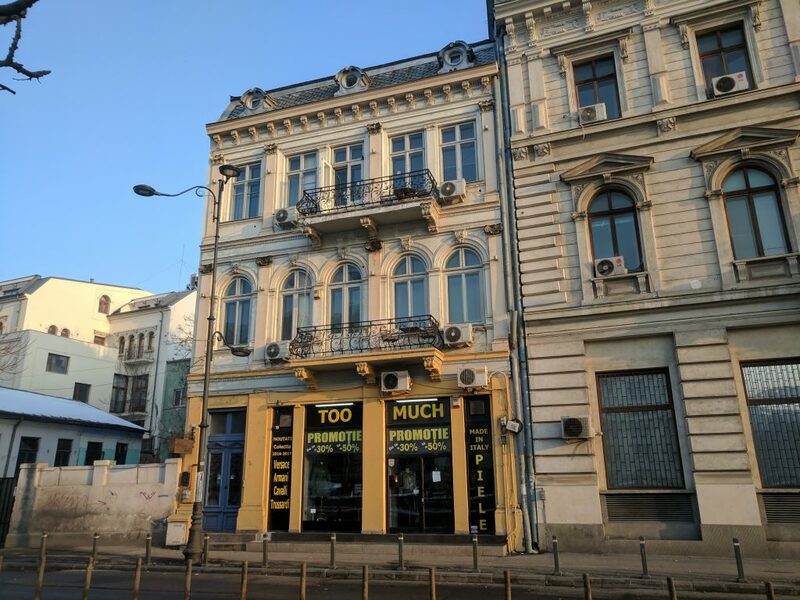 I should mention that Bucharest used to be called the Paris of the East. They even have a huge Arc de Triomphe replica in one of the roundabouts! 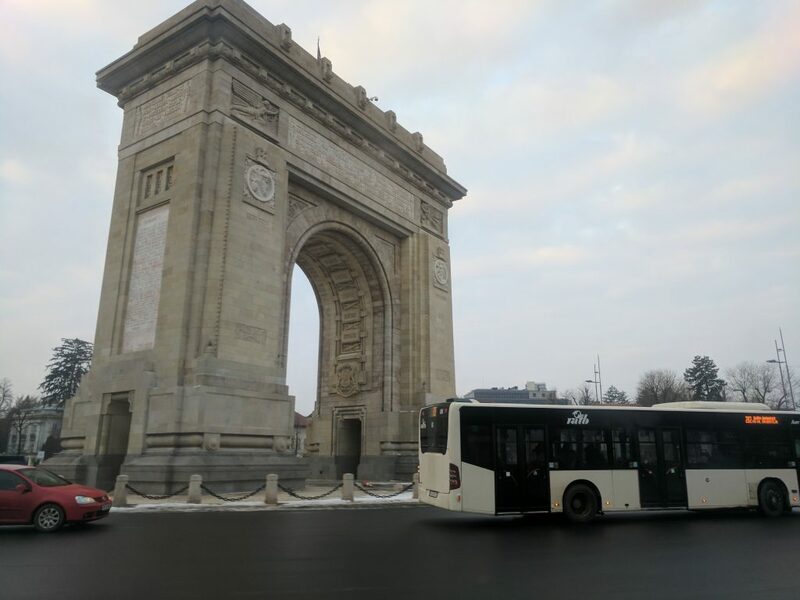 Bucharest’s Arc de Triomphe replica, as seen from the bus to the airport. 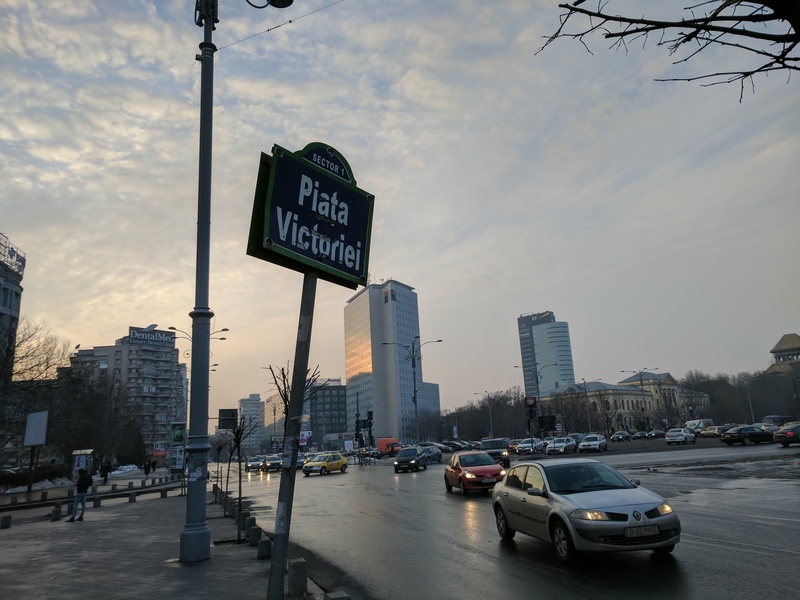 The reason I started at Piața Romană is because my audio tour started there. On this trip I decided to try an app called “izi travel,” which has free and paid audio tours of cities that use your GPS location to guide you and play the right descriptions. This system is great for me because I can do a tour of the city as if with a tour guide, but I don’t have to give up the ability to stop for a geocache, snack, or museum visit. It always pains me to hear a tour guide say something along the lines of, “if you have time after the tour, you can come back and do X.” With my new app I did two slightly overlapping tours. 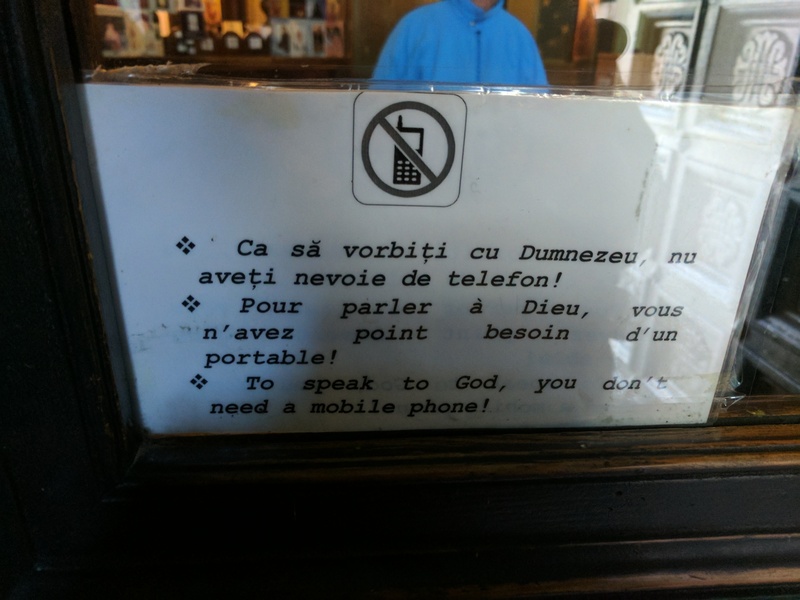 One was the free general tour of Bucharest: all the best tourist sites. The other tour was the Old City Center tour, which cost me about $4 to download. I really loved both tours, and they taught me a lot. The Revolution Square and Memorial of Rebirth. 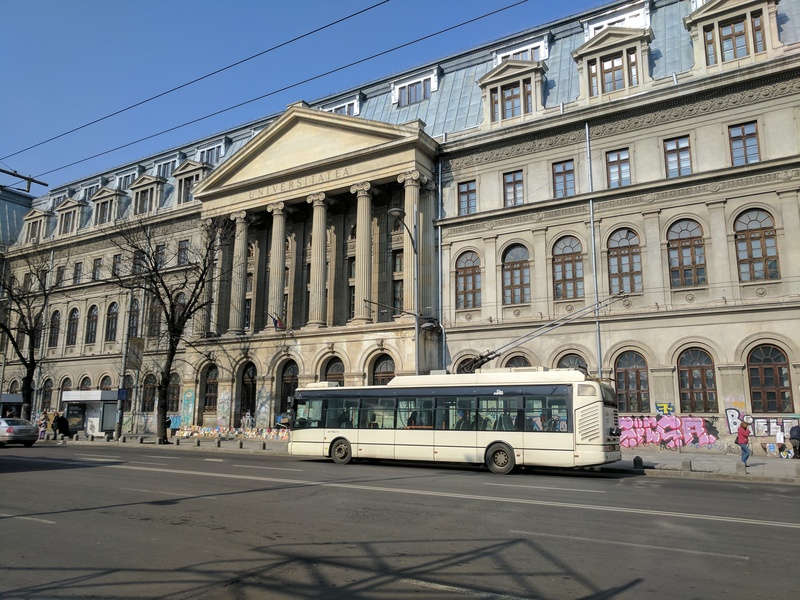 Note the former headquarters of the Communist Party to the left, which today houses the Ministry of Interior and Administrative Reform. 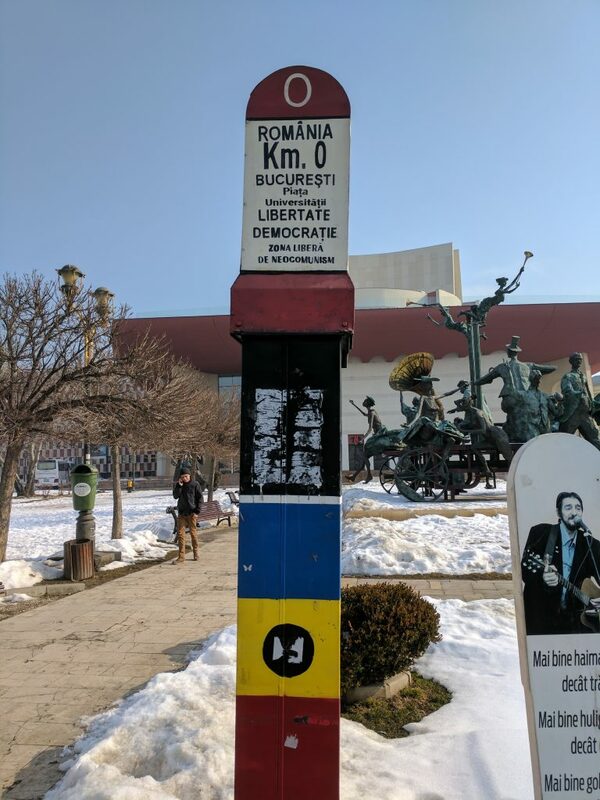 I learned a lot about the revolution of 1989 and the overthrow of Communist leader Nicolae Ceaușescu, as well as life during the Communist regime. 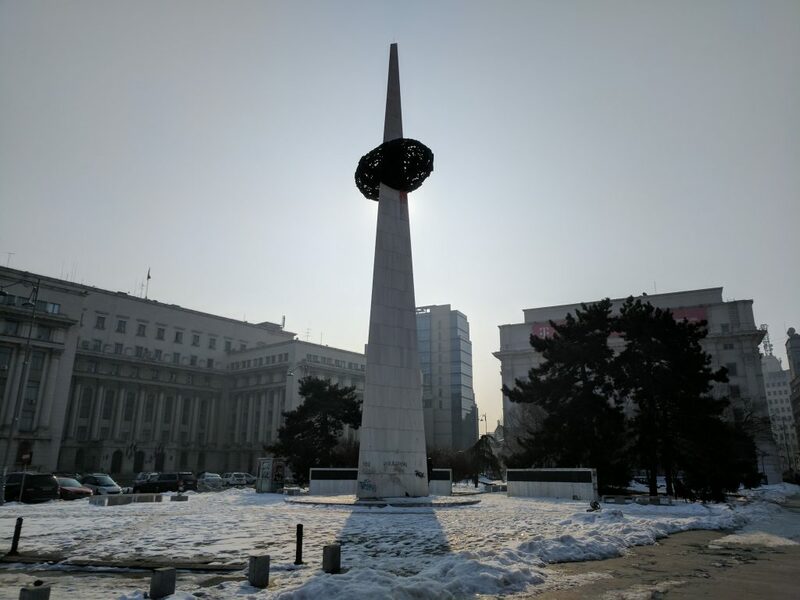 The revolution square, in front of the former Communist Party headquarters, is where the regime was finally overthrown, and has a large memorial, called the Memorial of Rebirth. 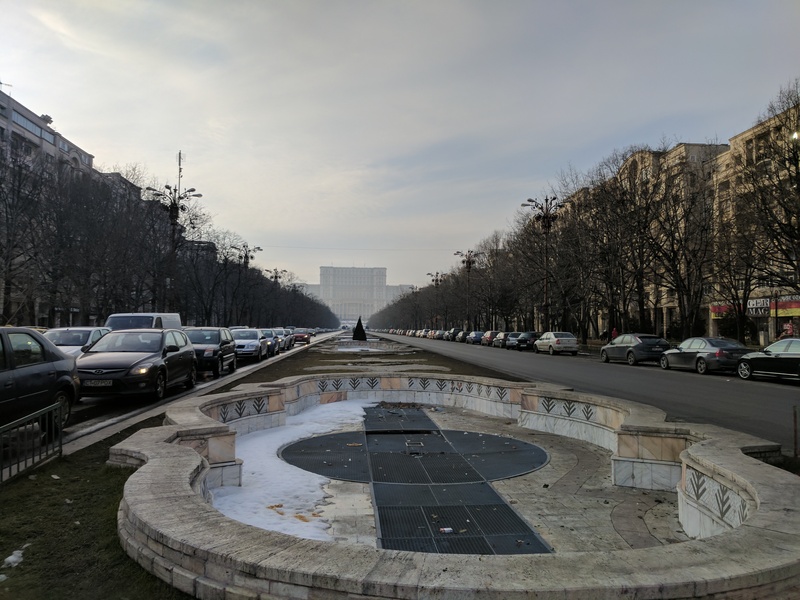 Another related sight in Bucharest is the “Ground Zero of Democracy” monument on the University Square, which is where democracy started with the revolution and overthrow of Ceaușescu. 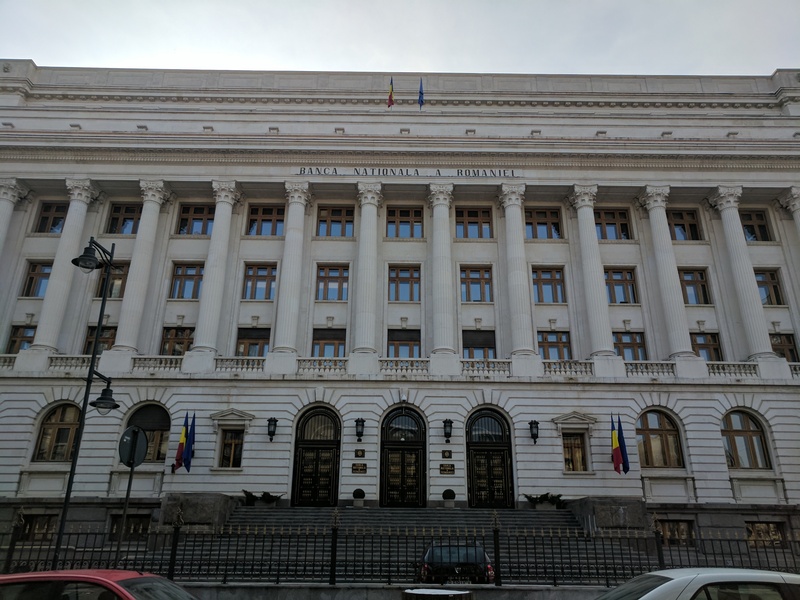 The University Square was the main epicenter of the revolution, which is why it is the symbolic origin of democratic values in Romania. Democracy Ground Zero on the University Square. 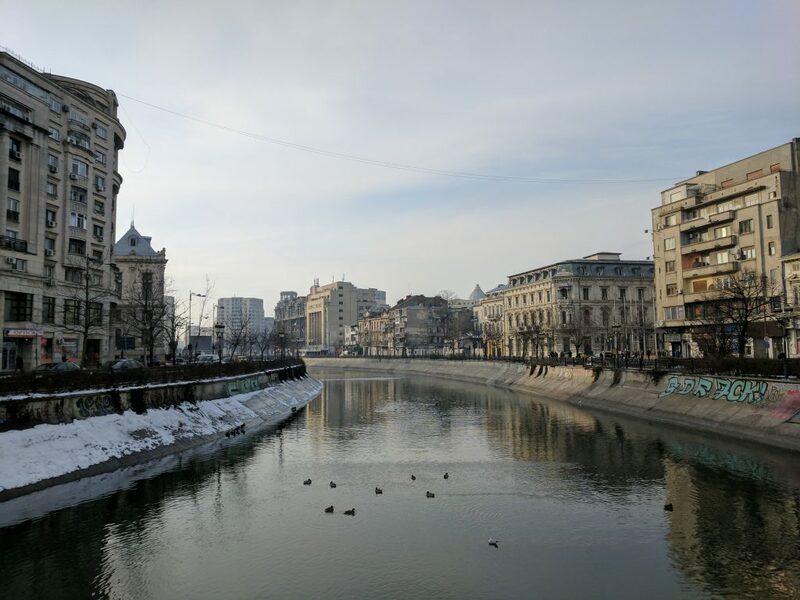 Another interesting thing is that the course of Bucharest’s main river, the Dambovita River, was changed during huge infrastructural works in the 1970s and 80s. 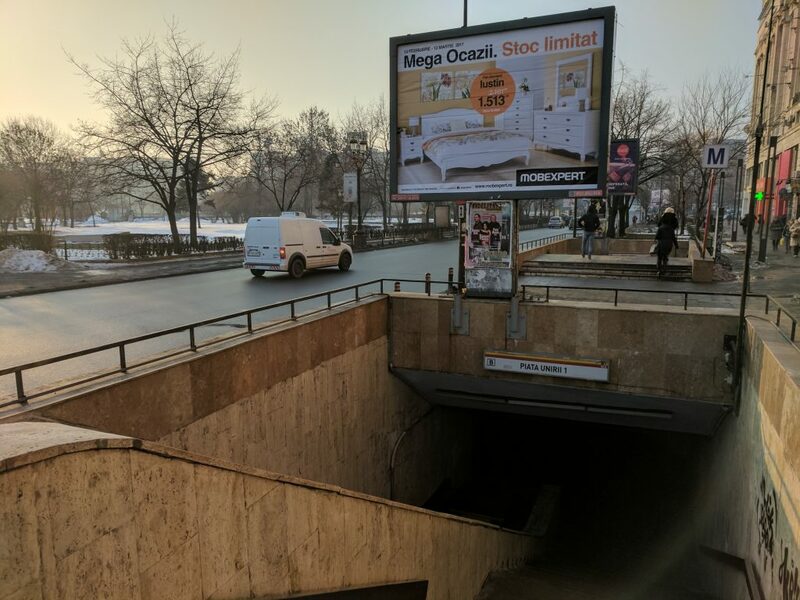 Nowadays, around the Piata Unirii the river flows under two subway lines, an overpass, and a pedestrian overpass. This is the context of a joke that I found quite funny. It goes: What does the Danube River flow into? The Black Sea. And what does the Dambovita River flow into? The subway. The Dambovita River, looking away from the Piata Unirii (and the subway). 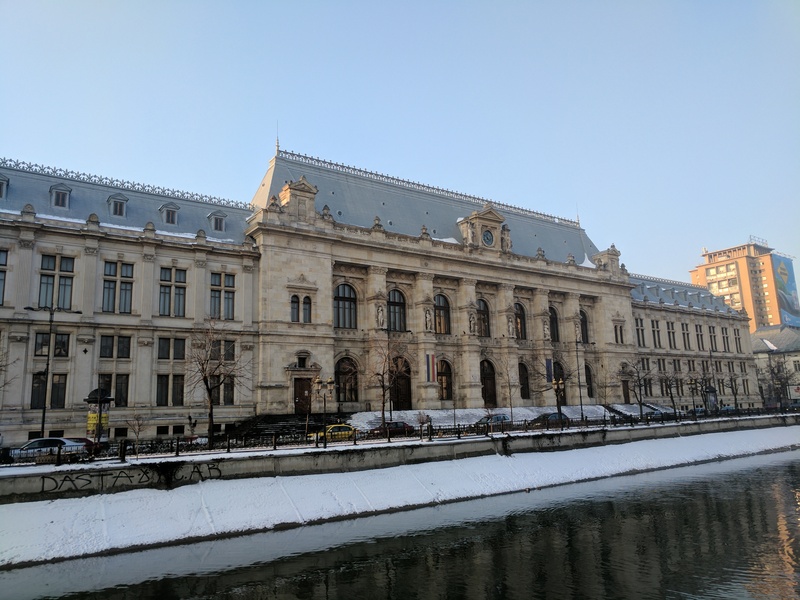 Besides infrastructural jokes, some of the highlights of the tour were the Romanian Athenaeum, the former Royal Palace (now the National Museum of Art), the Revolution Square and Memorial of Rebirth, and the CEC Palace (probably my favorite building in Bucharest). 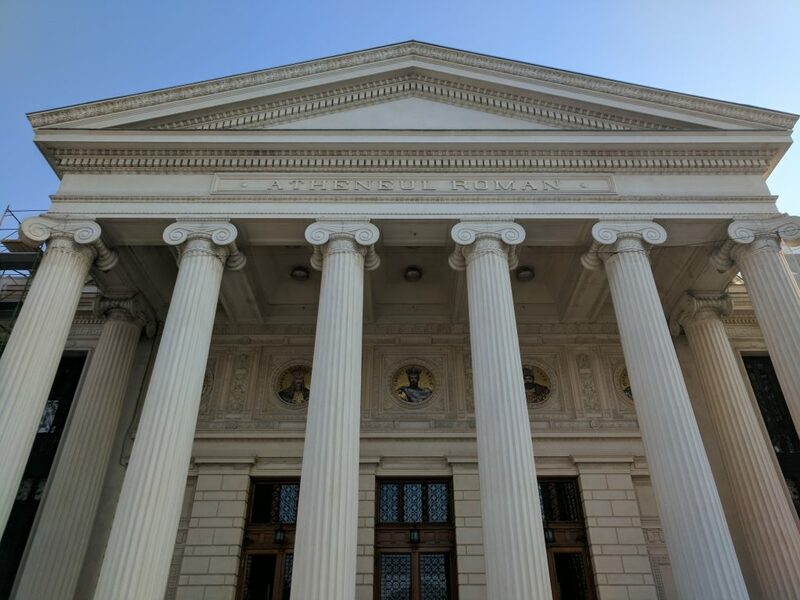 The columns of the Romanian Athenaeum. 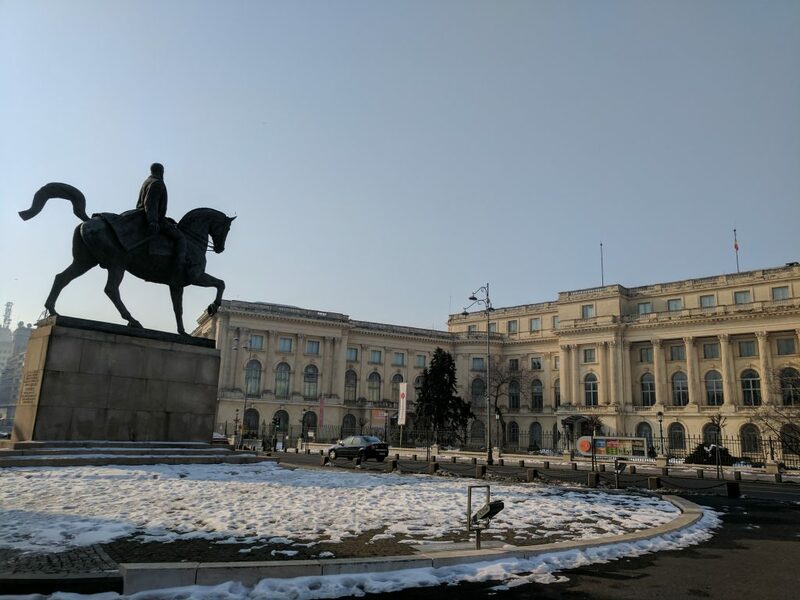 The Royal Palace (now the National Museum of Art) and the adjacent statue of King Charles I of Romania (reigned 1881-1914). The CEC Palace, built in 1900. Headquarters of the CEC Bank. 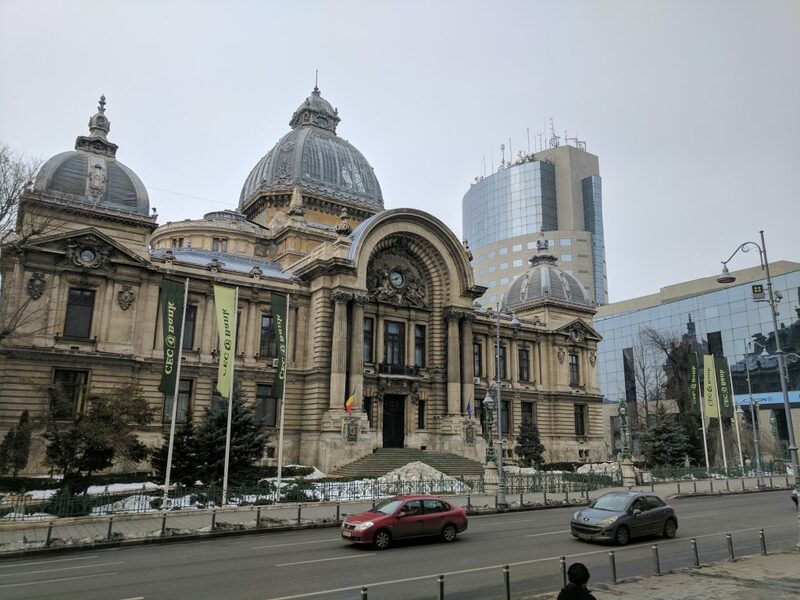 Along my tour I visited the Museum of Bucharest, which had a nice exhibit about the history of Bucharest and Romania. I also visited the National History Museum of Romania, which had a cool full-scale reproduction of Trajan’s Column in Rome. 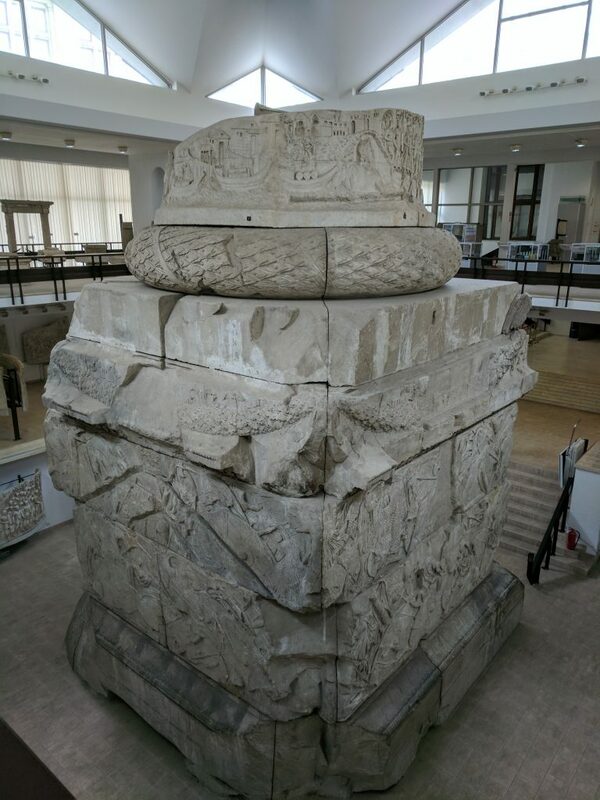 The base of the Trajan’s Column replica. The panels around the column were displayed individually in the surrounding exhibit. 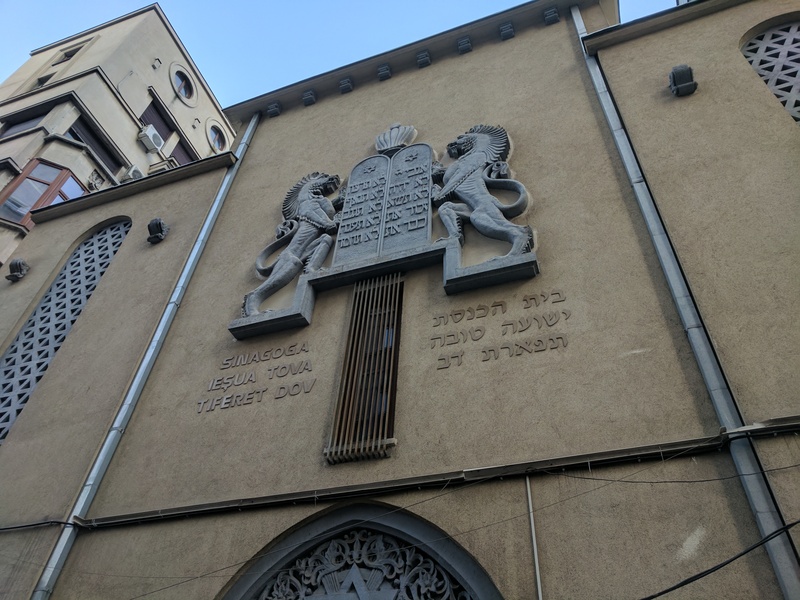 After my tour I continued walking around the city, finding some geocaches and exploring. On Sunday, my flight back to Berlin was at 10:40, so I had to basically go straight back to the airport in the morning. I did build some extra time in for a little walk and geocache. 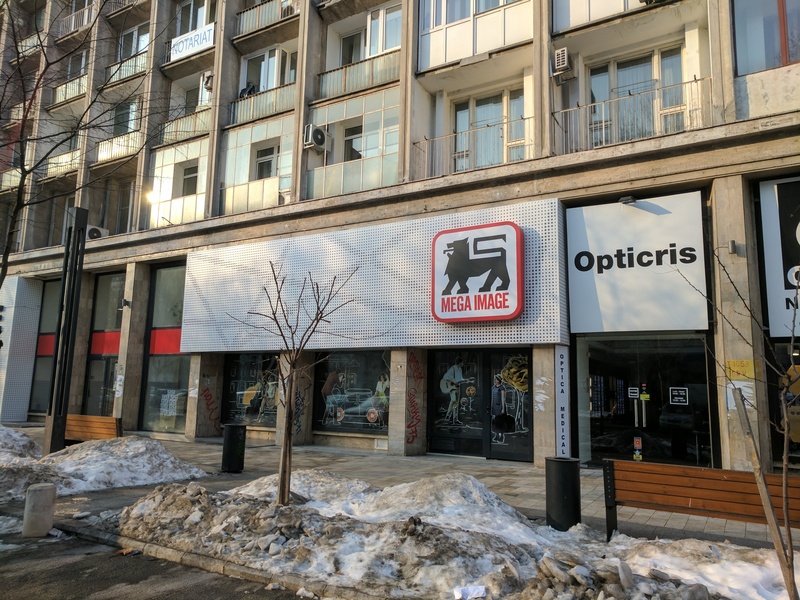 The Romanian brand of Delhaize (Food Lion in the US) is called MEGA IMAGE. Cool! 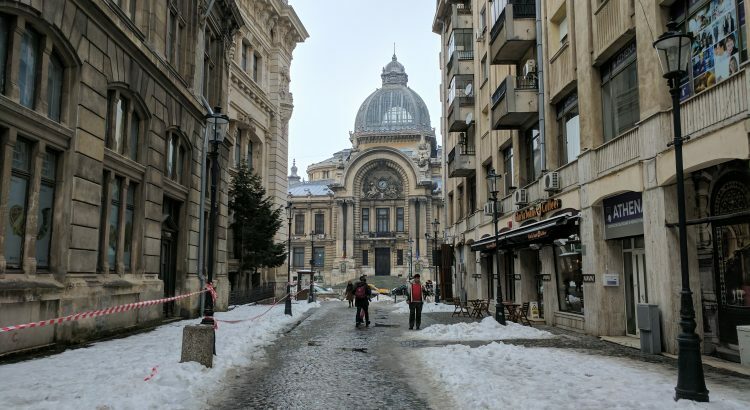 All in all I had a wonderful trip to beautiful Bucharest. I hope you enjoyed reading about my trip! !